The group released a report last month arguing that numerous construction problems and apparent code violations could increase chances of a spill on the southern leg, dubbed the Gulf Coast pipeline. Unlike the southern leg, the northern segment crosses the U.S.-Canadian border and therefore needs a presidential permit. The energy giant is currently awaiting an answer from President Barack Obama, which has so far designated the State Department to review whether the pipeline is in the U.S. national interest. The group identified at least 125 imperfections in a span of 250-miles, inclduing dents, bad welds, improper backfilling, unintentional sags, insufficient pipe support and poor soil management. The $2.3 billion pipeline would carry more than 700,000 barrels of oil a day from the oil hub at Cushing, Okla. south to Texas Gulf Coast refineries. The project has been under construction since August 2012. Shawn Howard, spokesman for the energy company, said in a statement that all pipelines are tested to ensure that there are no leaks. Howard was responding to pictures suggesting that pipelines in the field are unsafe and faulty. Until recent years U.S. crude stored in Cushing was shipped north and east, but as more oil was produced in the Upper Midwest and in Canada, refineries in the eastern and northern U.S., as well as in Canada, have not been able to keep up with the glut. Currently the Canadian company is seeking U.S. approval to start construction of the northern half of the Keystone XL project, which would bring tar sands oil from Alberta to U.S. Gulf Coast refineries. 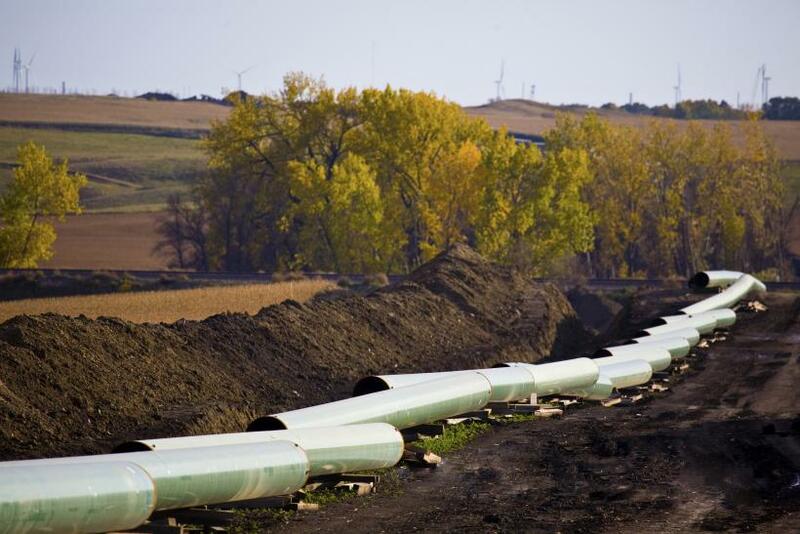 It is up to President Barack Obama to give the approval because the pipeline crosses the U.S. border. So far Obama has delegated the State Department to determine whether the project is in the U.S.'s "national interest." Opponents say extracting crude oil from Alberta is extremely energy-intensive and will accelerate climate change, because it requires breaking down a semi-solid form of petroleum, called tar-sands, so it can flow through a pipeline, something that is not necessary for normal crude oil. Proponents, on the other hand, say the benefits of the pipeline outweigh the environmental risks because it will reduce America's dependence on oil from hostile, unstable countries in the Middle East and elsewhere. Environmentalists have been fighting the entire project, but one reason the Gulf Coast pipeline has gained less attention than the northern part is that it does not cross an international border. That does not mean environmentalists have not been fighting the project’s southern leg. Why Did Obama Approve A Pipeline But Not Keystone?